Our active cases are down substantially from the onset but we are not out of the woods yet. 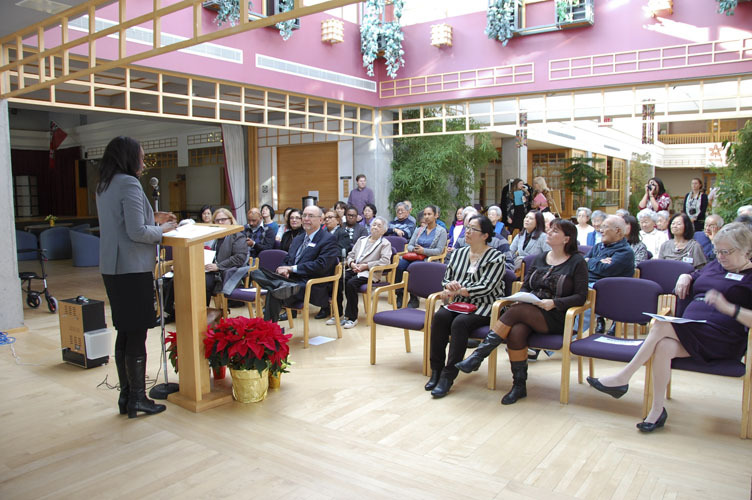 In the meantime, we have been in daily communication with officials at Toronto Public Health. With everyone’s vigilance and a bit of luck, hopefully we can soon report the end of the outbreak and full resumption of programs. Reminder: Yard Sale This Saturday (August 27)! Help! We are bursting with stuff. Stop by this Saturday from 9:00 a.m. – 1:00 p.m. for the mother of all yard sales! Bad news on the homefront – yesterday evening’s thunderstorm and heavy rains caused flooding to sections of our 1st and 2nd floors. Emergency responders and Momiji staff were quick to react but damage is still extensive. Tenants’ living areas are not affected. Momiji Barbecue : Date will change to Wednesday, August 10! Please notify your family members and friends who have tickets. Ticket sales will be extended for one week. Please note: Due to recent flooding affecting food preparation areas, the new date of the Momiji Barbecue is Wednesday, August 10, 5:00 – 6:30 p.m.
Our annual Momiji Barbecue – always one of our most popular and best-attended special events of the year – will be held on Wednesday, August 3, from 5:00 to 6:30 pm. As usual, the Barbecue will feature burgers fresh off the grill with all the traditional fixings, accompanied by a wide array of salads, onigiri, shoyu wieners and more, all prepared by our tenants and volunteers. Why not join our tenants and caregivers, board members and volunteers for a delicious taste of summer, with a Momiji twist! Tickets are just $5.00 for everyone, and can be bought at Momiji by Friday, July 29 at the latest! Please join us at our Blowout Yard Sale Extravaganza on Saturday, August 27 from 9:00 a.m. – 1:00 a.m. The Yard Sale will be held in our Garden. There will be great deals on House wares, toys, books and much more. 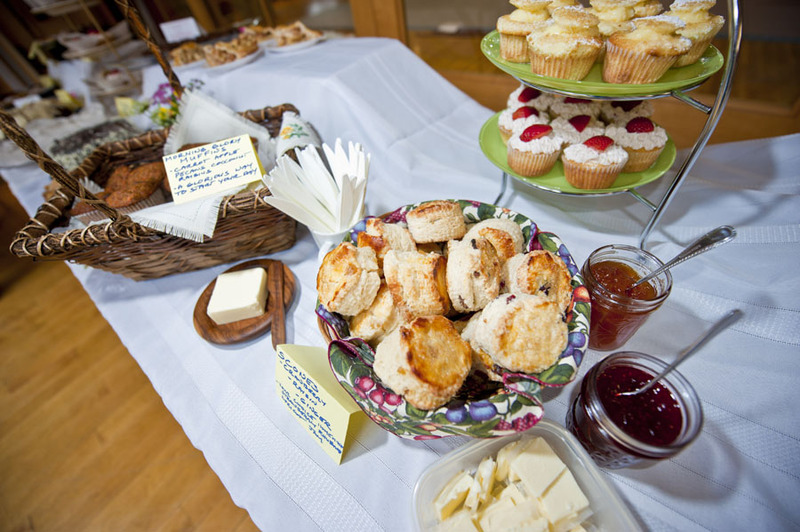 Coffee and muffins will be for sale from 9:00 a.m. – 11:00 a.m. followed by a delicious BBQ. Buy a cup of coffee and take home the mug! 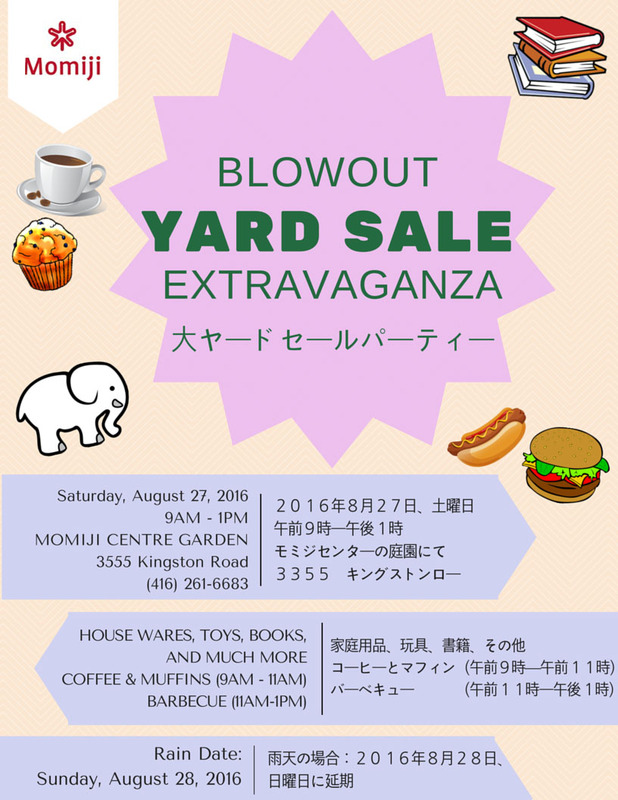 Money raised at the Yard Sale will help Momiji continue to provide the very best in seniors’ care here and in the community. It’s finally here this Saturday, June 25th – Momiji’s Crafts, Collectibles & Café event. Doors open at 10:00 am. Free admission. Shop til you drop, and then relax in our stylish Café and enjoy one of our fabulous homemade delectable meals and desserts.